Someone accepted a pull request which they shouldn't have. Now we have a bunch of broken code merged in. How do you undo a pull request? I was just going to revert the changes to the commit just before the merge, but I noticed that it merged in a bunch of commits. So now there are all these commits from this person from days before the merge. How do you undo this? There is a better answer to this problem, though I could just break this down step-by-step. Now you want to revert the entire pull request with the ability to unrevert later. To do so, you will need to take the ID of the merge commit. In the above example the merge commit is the top one where it says "Merged pull request #123...". Look at your commit graph (with gitk or a similar program). You will see commits from the pull request, and you will see your own commits, and a merge commit (if it was not a fast-forward merge). You just have to find the last of your own commits before the merge, and reset the branch to this commit. Reset to this commit, and you should be fine. Now confirm that you are really on the commit I marked there, and you will see none of the pulled stuff in its ancestry. (if your github remote is named origin - else change the name). Note that if anyone else already might have pulled your master with the wrong commit, they then have the same problem as you currently have, and can't really contribute back. before resetting to your new master version. If it is likely that this happened, or you simply want to avoid any problems, use the git revert command instead of git reset, to revert the changes with a new commit, instead of setting back to an older one. (Some people think you should never do reset with published branches.) See other answers to this question on how to do this. If you want only some of the commits of RogerPaladin's branch, consider using cherry-pick instead of merge. Or communicate to RogerPaladin to move them to a separate branch and send a new pull request. with the commit hash being the commit PRIOR to merging the pull request. This will remove all commits from the pull request without influencing any commits within the history. This should revert the branch back before the pull request WITHOUT affecting any commits in the branch peppered into the commit history between commits from the pull request. If you were to click the revert button on the pull request, this creates an additional commit on the branch. It DOES NOT uncommit or unmerge. 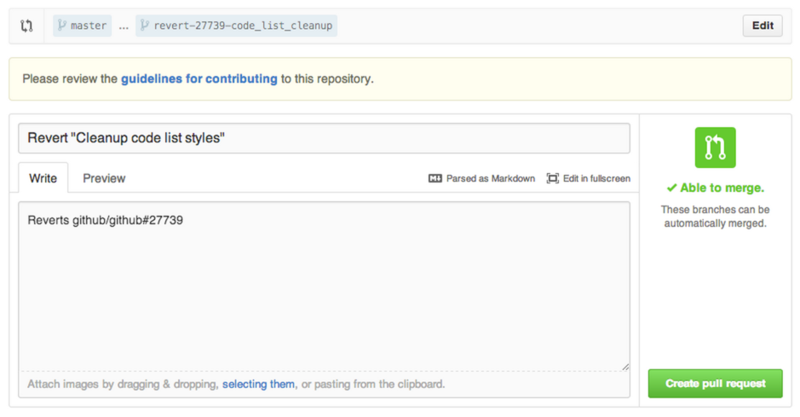 This means that if you were to hit the revert button, you cannot open a new pull request to re-add all of this code. I use this place all the time, thanks. I was searching for how to undo a pull request and got here. I was about to just git reset --hard to "a long time ago" and do a fast forward back to where I was before doing the pull request. As with most things in Git, if you're doing it some way that's not easy, you're probably doing it wrong. Not the answer you're looking for? Browse other questions tagged git github merge pull-request or ask your own question.